The 35th Infantry Regiment Association salutes our fallen brother, PFC Dunnick Newton Ness, RA13279846, who died in the service of his country on May 26th, 1951 in South Korea. The cause of death was listed as KIA. At the time of his death Dunnick was 20 years of age. He was from York, Pennsylvania. Dunnick's Military Occupation Specialty was 4745-Light Weapons Infantryman. The decorations earned by PFC Dunnick Newton Ness include: the Combat Infantryman Badge, the Purple Heart, the National Defense Service Medal, the Korean Service Medal, the United Nations Korea Service Medal, and the Republic of Korea War Service Medal. Private First Class Ness was a member of the 35th Infantry Regiment, 25th Infantry Division. He was seriously wounded by the enemy in South Korea on February 5, 1951 and returned to duty on February 24, 1951. He was Killed in Action while fighting the enemy in South Korea on May 26, 1951. Private First Class Ness was awarded the Purple Heart with Oak Leaf Cluster, the Combat Infantryman's Badge, the Korean Service Medal, the United Nations Service Medal, the National Defense Service Medal, the Korean Presidential Unit Citation and the Republic of Korea War Service Medal. Dunnick is buried in Mount Rose Cemetery, York, PA.
A Purple Heart veteran of the Korean fighting is the 11th York-Countian reported killed in action in Korea. Mrs Treva Euculano of 34 West Jackson Street, received a telegram Tuesday evening telling of the death of her son, Dunnick N Ness, on May 26; less than three months after he was returned to duty following wounds suffered February 5th. The last word received from 20-year old Pfc Ness was written the day before he was killed. In that letter, the veteran stated he was about five miles south of the 38th Parallel and moving northwards. 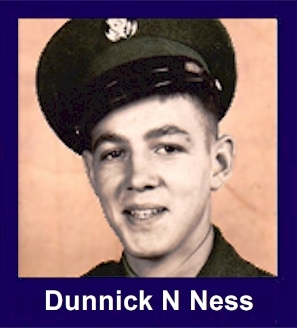 Pfc Ness was serving as a rifleman with the 35th Infantry Regiment of the 25th Infantry Division. He enlisted August 23, 1948, and was sent to Japan in December of the same year. Surviving besides his mother are his step-father, Tony Euculano, same address; a brother, Murry Ness, 226 Green Street; and a sister, Mrs Geraldine Ness Snyder, Kent, England. She is living with her husband, who is stationed in England with the U.S. Air Force, Pfc Ness is also survived by his paternal grandparents, Mrs Anna Leffler, 226 Green Street; and Edward Leffler, New York City.